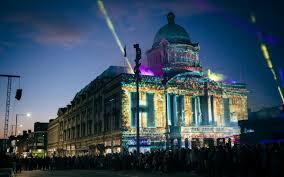 “City of Culture” is an event held every four years high­light­ing one loc­a­tion in the UK and pro­mot­ing arts and cul­ture as a means of cel­eb­ra­tion and regen­er­a­tion. In 2013 Kingston upon Hull was one of sev­eral cities to submit a bid for the event Their sub­mis­sion was suc­cess­ful based on the pro­posed use of thou­sands of volun­teers and a budget of £12m. They man­aged to recruit Martin Green as the CEO and Director of a new inde­pend­ent com­pany and char­it­able trust named “Hull UK City of Culture 2017”. He has exper­i­ence of organ­ising large events includ­ing parts of the London Olympic Games. He at an early stage set the budget for the event at £18m and set about rais­ing the money. In the event over £30m was raised. James McGuire was born and edu­cated in Hull and is employed for 2017 by the new Company as the Audience Engagement Manager. He explained how the City was extens­ively bombed during WW2 to be fol­lowed by the loss of its fish­ing industry to Iceland. The main long stand­ing indus­tries include Smith & Nephew, Armco, BP and pre­fab­ric­ated build­ings and cara­vans. Despite its well regarded uni­ver­sity and its motor­way con­nec­tion, there was a feel­ing in 2013 of a com­munity in decline. A local joke at the time was “you’ll find more cul­ture in a yogurt pot than in the whole of Hull”. The present Hull is very dif­fer­ent. It has a grow­ing off shore wind tur­bine industry, its tour­ism industry is expand­ing with a new hotel in the city center and a pro­posed pas­sen­ger liner ter­minal planned to aug­ment the ferry ter­minal. By attract­ing 2,500 local volun­teers and refur­bish­ing city center build­ings there is a wel­com­ing buzz and a belief in the future of the city. Although the city of cul­ture is a 12 month event, the impetus gained will con­tinue into the years ahead. In 2017 the activ­it­ies were centered on four sea­sons. The 1st (January to March) was “Made in Hull” and chal­lenged pre­con­cep­tions and showed what Hull is really made of. The 2nd (April to June) was “Roots and routes” and explored Hull’s place in a con­stantly chan­ging world. The 3rd (July to September) was “Freedom” where it cel­eb­rated its rebel­li­ous streak and its free­dom of thought, unboun­ded by con­ven­tion. The 4th (October to December) will look to the future and “Tell the world”. It will look at how Hull is rede­fin­ing itself as a key city within the North. Previous PostThoughts on the History of Crime, the Courts and Capital Punishment — Peter Stubbs — 16th October 2017.Next PostThe True Story Of Burke And Hare — Prof. Christopher Dorries OBE. — 30th October 2017.